Thank you to each of you who responded to our special plea for help last month. As this is written, we are slowly digging out of our ocean of red ink, and it’s thanks to good people like you. Our troubles started in September of last year, as many of our friends came to the aid of Hurricane Katrina victims. National disasters have hit us in the past, but this one struck us especially hard, and we are still reeling from this one more than a year later. On Christmas Day, as every day, you will be in our thoughts and prayers. Thank you for making this award-winning Catholic station’s work possible in the frozen north. WALLET GOBBLER: (left) In one of Nome’s small grocery stores, KNOM program director Kelly Brabec checks out turkeys for the station’s Thanksgiving and Christmas staff dinners. At $2.99 a pound, the gobbler Kelly holds is about fifty dollars. Because of Nome’s isolation, all food is shipped in by air, and the average cost of food is 186% that of the Lower 48. In some of the villages we serve, food is almost double that. You can imagine that we don’t often buy turkey! In villages, most people rely on subsistence hunting and fishing to reduce the cost of feeding their families. By the end of this month, we will have broadcast 34,000 of them during 2006, plus 34,000 inspirational spots, thanks to you. On Christmas, how many will sing hymns, and how many will cry with hopelessness? Lord, help me to be generous, to reach out to help at least one of Your children, so that one more voice will sing in Your birthday choir this year. Born in a stable. A choice He made. Simplicity and poverty. A choice no temporal power or influence would have ever suggested. A choice — God became man in a way no one would have ever guessed. Do you suppose He was trying to tell us something? 4,000: That’s how many people attend the annual Alaska Federation of Natives convention. In villages, many more enjoy front row seats thanks to KNOM’s extensive coverage. (Left) In Anchorage, Amy Flaherty holds a microphone to the loudspeaker as in the background, the King Island Eskimo Dancers perform. In addition to recording live traditional performances for KNOM’s library, Amy produced sixteen reports and news stories during the six-day event. Back in Nome, she produced another nine, using interviews she recorded. Originally from Cottage Grove, Minnesota, Amy is our mission’s public affairs director, overseeing KNOM’s call-in programs and daily interviews, as we help people of our region discuss the many critical issues which they face. It’s important that both Mr. Bell and Ric Schmidt of KNOM be notified in writing that the gift is intended for Alaska Radio Mission - KNOM. Bequests: Many of our mission's friends have added us to their wills. For many, these gifts will be much larger than they could afford during their lifetimes. Speaking of prayer, that’s a supremely important way you can help. Thank you for your financial support and your prayers! May God bless you for them! WE RESPECT YOUR PRIVACY, and we renew our pledge to you that we will never give your name or address to anyone for any reason. A Child is born for us, Your Son is given to us. Your eternal Word leaped down from heaven in the silent watches of the night, and now your church is filled with wonder at the nearness of her God. Open our hearts to receive His Life and increase our vision with the rising dawn, that our lives may be filled with His Glory and His Peace forever and ever. Amen. 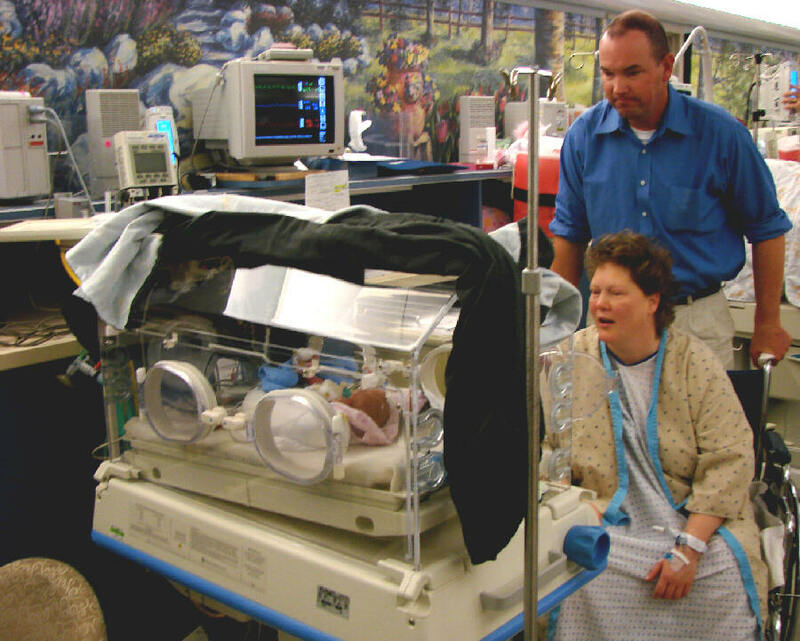 YOUR PRAYERS ARE REQUESTED: (left) John and Robyn Woyte visit one-day-old daughter Sophie in Anchorage’s Providence Hospital. Robyn works part-time in the KNOM business office. 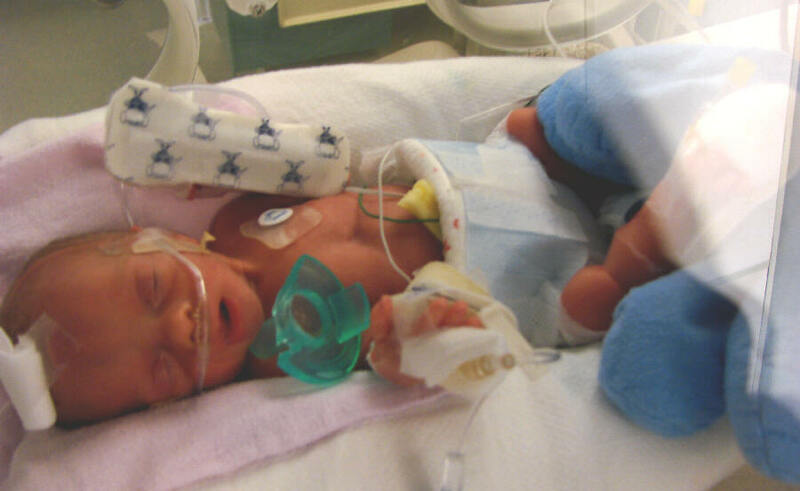 When she was 28 weeks pregnant, her baby stopped moving. She was rushed to Anchorage, where doctors waited as long as they dared before delivering little Sophie. They could afford less than a day. 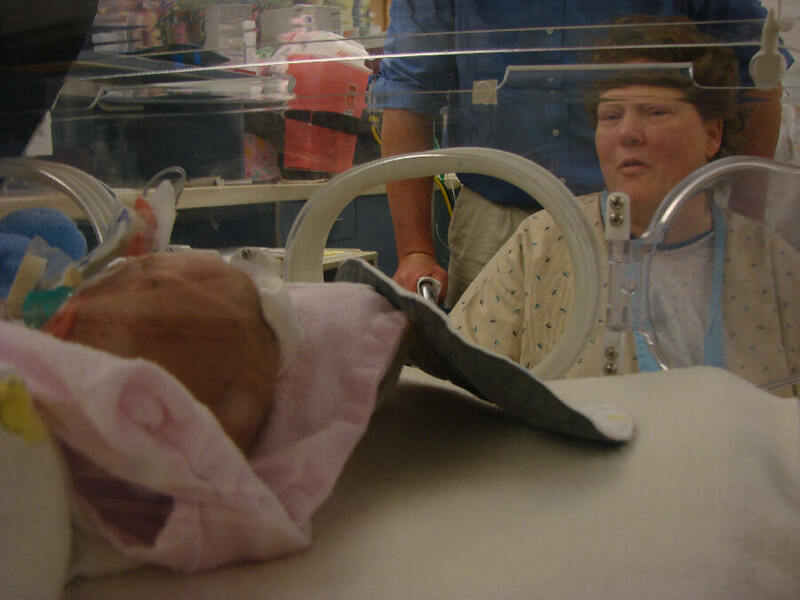 At birth, Sophie weighed only 2 pounds 4 ounces. Briefly on the operating table, the hearts of both mom and baby stopped. (Left) You can see the love and concern in Robyn's eyes. Sophie was breathing on her own from the start, and has been taking food, through a tube to her stomach. In the top photo, John, who is a major in the Alaska Army National Guard, sees his daughter for the first time. He had arrived at the hospital only a few minutes earlier, after a grueling two-day journey from his tour of duty in Iraq. Robyn agreed that we could share this most personal story with you, hoping that you will add the Woyte family, and especially little Sophie, to your daily prayers. (Left) Tiny Sophie Woyte is holding her own at the age of one day. A few weeks later, while she has developed diabetes and remains at risk for all sorts of things, every day brings good news. The oldest Catholic radio station in the United States, the KNOM mission serves Eskimo, Aleut and Athabascan Indian families in isolated villages throughout more than 100,000 square miles of Alaska — and eastern Russia, too — entirely thanks to you. Dear God, grant strength to all who must endure the Christmas season in personal sorrow, loneliness or depression. I offer to You on behalf of those who suffer during these times any pain or disappointment I may experience during the celebration of Your birth this Christmas. Amen. What does Christ want at His crib? More donkeys? More shepherds? More gold or frankincense? Actually, Christ wants you at the crib, and He wants you with a heart filled with faith and love. BLOW, GABRIEL, BLOW! 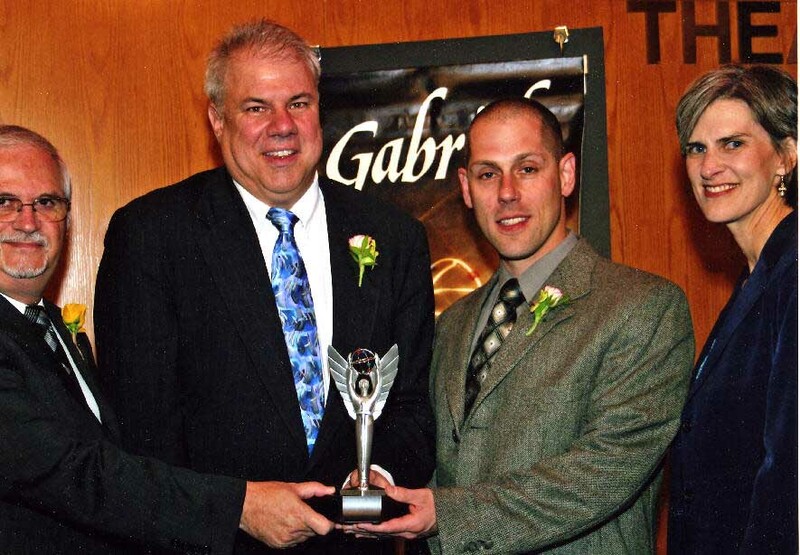 (left) From left, Gabriel Award co-chair Frank Morock, KNOM general manager Ric Schmidt, news director Paul Korchin, and Catholic Academy for Communication Arts Professionals president Jeanean Merkel. Interestingly, KNOM is the only religious radio station, and the only small one, to be honored by this prestigious national award. The television winner was giant WCVB-TV in Boston. Yay, team! NETWORKING: At 8 PM on November 8th, Tom Busch moved some wiring and KNOM switched from Associated Press to ABC for its hourly network newscast. We had been with AP since 1979. Of late, their broadcasts have been less “newsy” and more entertainment-oriented. ONCE AGAIN, IT COMES DOWN TO PRAYER: Frequently, contributors send us prayer intentions. For some, it’s an illness, or the illness of a loved one. For others, a death. For others, a child’s loss of faith. From your own experience, you can imagine the worries and pains that are suffered by our many friends. We remember everyone in the KNOM family in our prayers, and we ask that you add their intentions to your prayers, too. Thank you! THIRTY-FIVE YEARS AGO: It was KNOM's first Christmas. Volunteer Engineer Tom Busch built and hauled a lighted three-foot star to the top of the station's 49-foot studio tower, to proclaim Christ's birth. This star, as well as five others, were destroyed by Nome's merciless wind. (In Autumn 1997, engineer Les Brown built a star out of electrical conduit, aerodynamically lit by flexible tubular lights. THIRTY YEARS AGO: It was KNOM's 6th Christmas. In December 1976, KNOM volunteer morning announcer Mary Pat McElligott entered the first sled dog race of her life, a 10-miler, vying against eleven competitors. Extremely jittery, Mary Pat prayed that she could make it to the finish line without losing the team. She finished second, and was on cloud nine. YOUR CONTRIBUTIONS of prayer and finance are what keep our important mission alive and strong. We value your concern and your generous helping hand. Once more, as we celebrate Jesus’ birth, you and those you love will be in our prayers. May you enjoy a blessed Christmas!